1. Dip ladyfingers into milk to soften the biscuits. Place on a plate. Pipe whipping cream. 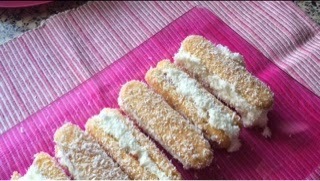 Place in milk dipped ladyfingers on top. Roll in coconut. 2. Place in refrigerator to set before serving.